The demand of one person is called individual demand and demand of many persons is known as market demand. The experts are concerned with market demand schedule. The following demand schedule of a consumer is presented. The table shows the demand of certain commodity at different price levels. The individual demand is the graphical presentation of individual demand schedule. The curve, which shows the relation between the price of a commodity and the amount of that commodity the consumer wishes to purchase, is called demand curve. 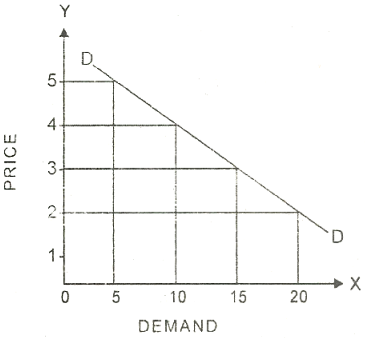 The individual demand is curve slopes from left down to right. 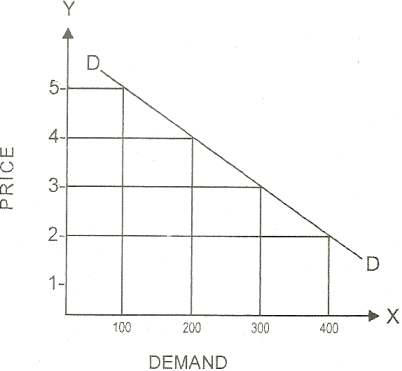 The following diagram shows the individual demand curve. The market demand schedule means 'quantities of given commodity which all consumers want to buy at all possible prices at a given moment of time'. The demand schedule of all individuals can be added up to find out market demand schedule. The following table shows the market demand schedule. The demand schedule can be presented graphically. The graph of demand schedule is called demand curve. It shows the maximum quantities per unit of time that all consumers buy at various prices. The following diagram shows market demand curve. The diagram shows that when price is 5 dollars the market demand is 100 kilograms. When price is 4 dollars the demand is 200 kilograms. When price is fixed at 3 dollars the demand is 300 kilograms . There is increase in demand to 400 kilograms when price is 2 dollars. It means there is inverse relationship between price and demand for goods. When price decreases the market demand for goods increases and vice versa.